You know you’re in for something special when you see Lady Liberty, dressed in mint leggings, jersey shorts, and high-tops, duke it out over immigration rights and citizenship status. Here, her opponent is a bright-eyed high school senior with a propensity for ancient languages and philosophy. He just happens to be an illegal immigrant from Santo Domingo, born just two years before his mother moved to the United States. 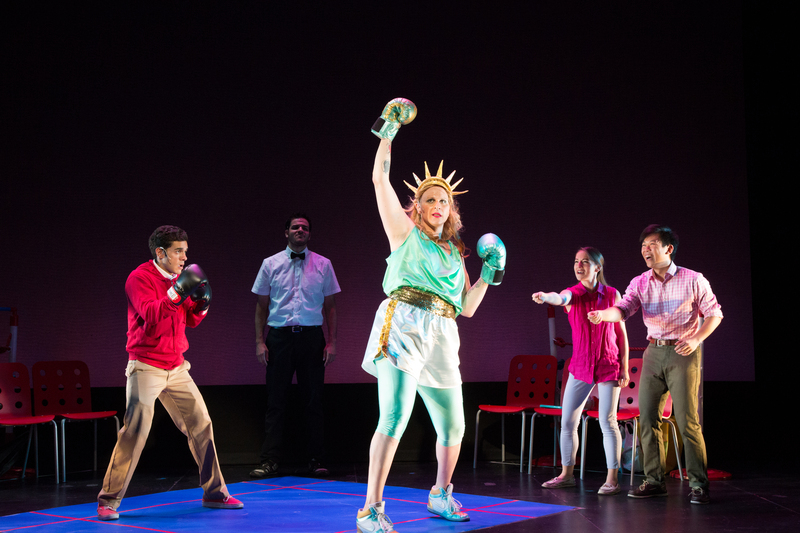 Manuel Versus The Statue of Liberty, written by Noemi de la Puente and David Davila, is an entertaining musical with pedagogical purpose. Most Americans know very little about the incredibly lengthy and complicated citizenship process, and many immigrants never hear about their personal rights, even as non-citizens. We are blissfully unaware of the plight of millions of people living on blocks or in our apartment buildings, and the writers of this new musical make sure that we start paying attention. There’s even a song called “Immigration 101,” in which Immigration service agents rap battle about visas, green cards, and regulations. Unfortunately, some of the plot’s most important information gets buried under fast-moving rap lyrics (some of the ensemble couldn’t keep up with the pace) or substituted by more sentimental songs.How would Manuel’s college education attract the attention of immigration police? How can he afford Princeton without financial aid? Likewise, I found myself feeling disappointed by the vagueness and cliches (“The American dream is the American nightmare”) built into a large portion of the lyrics. De la Puente and Davila’s songs blend genres and styles in thrilling and unique ways. With each song’s introduction, I never knew what to expect, but always felt pleasantly surprised. There’s Manuel’s dream ballad, “Sueno,” sung with deep authenticity by Gil Perez-Abraham, a youthful sparkle in his eye. Manuel’s mother, which Tami Dahbura plays with a loving conviction that reminds me of my own Hispanic grandmother, undoubtedly performs the best numbers, including the flavorful “No Se Puede” and the stirring “Ave Maria.” Shakina Nayfack nails Lady Liberty’s comedic timing, but struggles slightly with the musical numbers. An appealing musical with a great heart and an important message, Manuel Versus the Statue of Liberty has great things in store for it. With a little more precision in writing and production, it is sure to win over audiences.